Nothing says “timeless” like the cosmos. We’ve been gazing up at it for a couple hundred thousand years, and examining it more closely with telescopes since the 1600s. The skies have been a source of creative inspiration for humankind since we started using our hands to make things. This throwback Thursday, I want to share three astronomy-inspired beading patterns from the Out of This World Beading Projects Bundle that have been around for a while, themselves—but these classics will never go out of style. This beading pattern by Agnieszka Watts, originally published in the June/July 2014 issue of Beadwork magazine, uses simple netting techniques to bezel rivolis for this sparkling strand of stars. Two beaded strands encase star-like beads on either side of the clasp leading to a central delicate pendant. Develop your bezeling skills using a basic netting technique and create this gorgeous necklace inspired by the night sky. Liisa Turunen and Glenda Paunonen published this beading pattern in Beadwork April/May 2014. 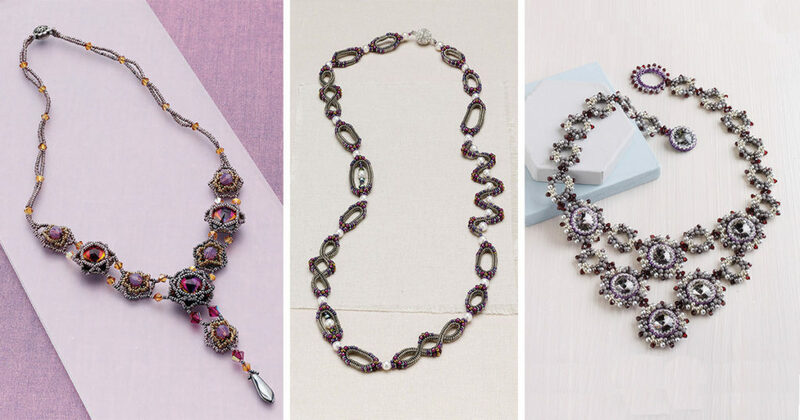 Transform tubular herringbone stitch to create a multitude of artistic shapes, and then link them together to form a gorgeous necklace. 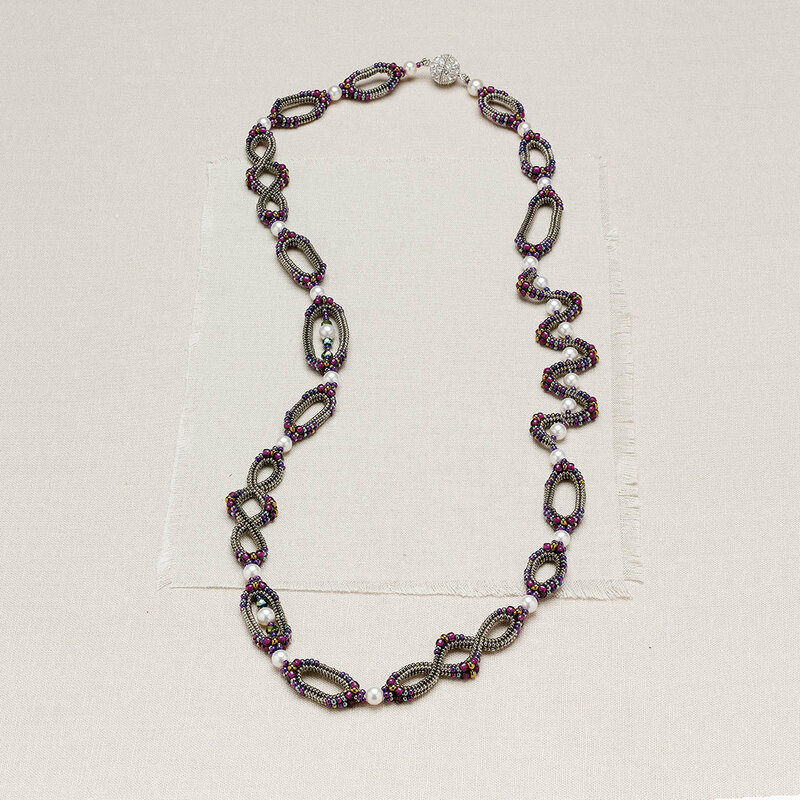 Incorporate a variety of beads and stitches to work up this interesting necklace. Build your ladder stitch, square stitch, tubular herringbone stitch, and fringe bead weaving skills with this project. 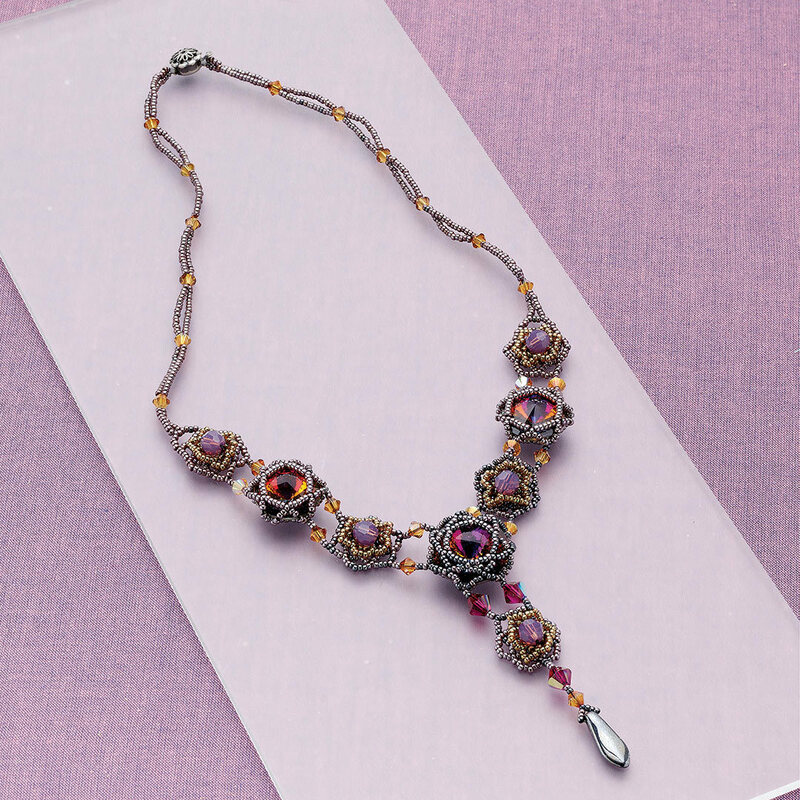 Originally published in the February/March 2011 issue of Beadwork magazine, Glorianne Ljubich combines dramatic and classy into this stunningly beautiful necklace. Combine peyote, herringbone, ladder stitch, and netting together to create this fascinating pattern. Blended seed beads and crystals add sparkle and interest to this dramatic and delicate design. Shine as brightly as a bright star every time you have this necklace adorning your neck. With our naked eye from Earth, we can only see a tiny fraction of stars and galaxies that are out there. The same is true of these three beading patterns—they represent only a little bit of what’s in the Out of This World Beading Projects Bundle. It’s packed with 15 outer-space inspired jewelry projects that will blast your creativity to the moon! 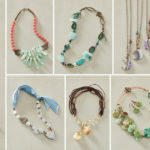 Get out-of-this-world beading projects in the Interweave Store!